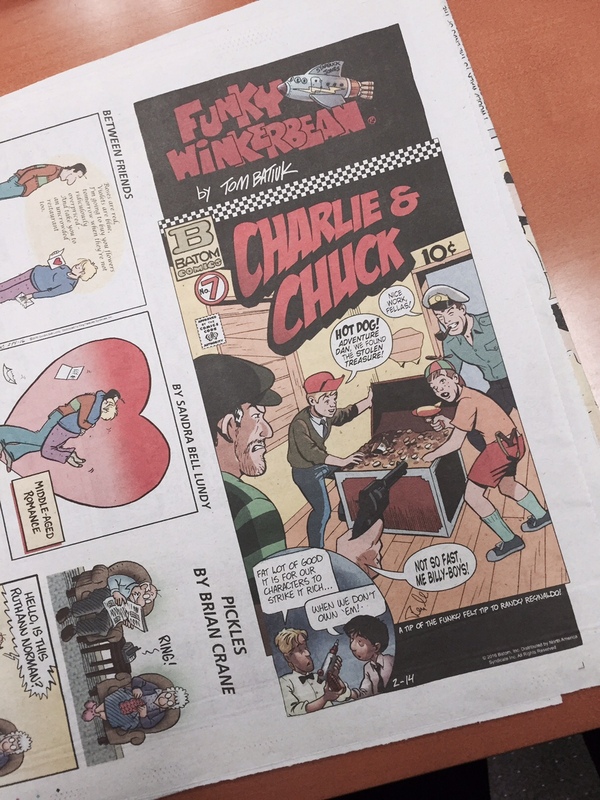 I recently fulfilled a childhood dream to appear in the syndicated funny pages, albeit in a one-off… The Feb. 14, 2016 comic-strip Funky Winkerbean featured a faux comic-book cover courtesy of yours truly! It’s actually a piece that was commissioned and completed awhile back, but now that it has finally made it to print, I can talk about it! My thanks to Funky Winkerbean’s writer-creator, Tom Batiuk, for the opportunity to be part of a fun project. He had seen my work before and our conversation morphed into his asking about my interest to produce a piece of commissioned art for the series. As part of a storyline in which a mother was tracking down missing issues in her son’s comic-book collection of his favorite comic-book series, Batiuk invited established comic-book artists—including Bob Layton, Neil Vokes, Michael Gilbert, Terry Austin, Mike Golden and Norm Breyfogle—to produce faux covers for a character named Starbuck Jones. (In actuality, it is a character Batiuk created and drew in elementary school.) An interview about the project can be found here. Batiuk was now extending the project and thought I’d be perfect for a kid adventure series he wanted to feature that he also created in his youth called Charlie & Chuck. For reference, Batiuk sent me samples of the original strips he created as a kid, logos, as well as the covers that already appeared. Otherwise, I was pretty free to come up with an appropriate cover. The art was produced in black and white, which Batiuk then colored in his studio. It was an honor and thrill to be asked to participate, and doubly so when he said I captured exactly what he was aiming for. I wasn’t aware of the appearance of the strip until I received a nice package from Tom that included clippings of the strip (pictured at right) and a high quality print of the final piece.